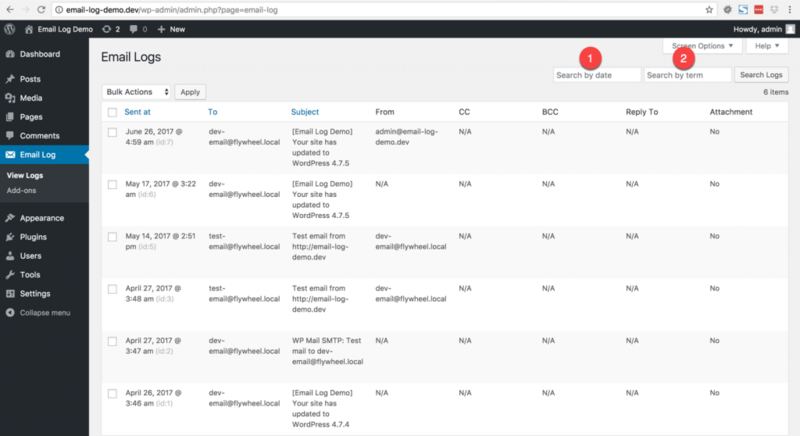 Email Log plugin allows you to search logged emails. You can either use ‘Search by Date’ or ‘Search by Term’ filters individually or both together, to filter the logged emails. The ‘Search By Date’ filter allows you to filter emails by sent date. The ‘Search By Term’ filter allows you to search logged emails. The search results fetches emails that matches the search term in either the ‘To’ field or the ‘Subject’ field. When you fill-in values on both filters, the result set displays emails that matches both conditions.